Guest blog – Fly me to…Wagga Wagga! As we left Montreal, a very big snow storm began. It was awful! And the last thing you wished to do was stay in the cold weather. 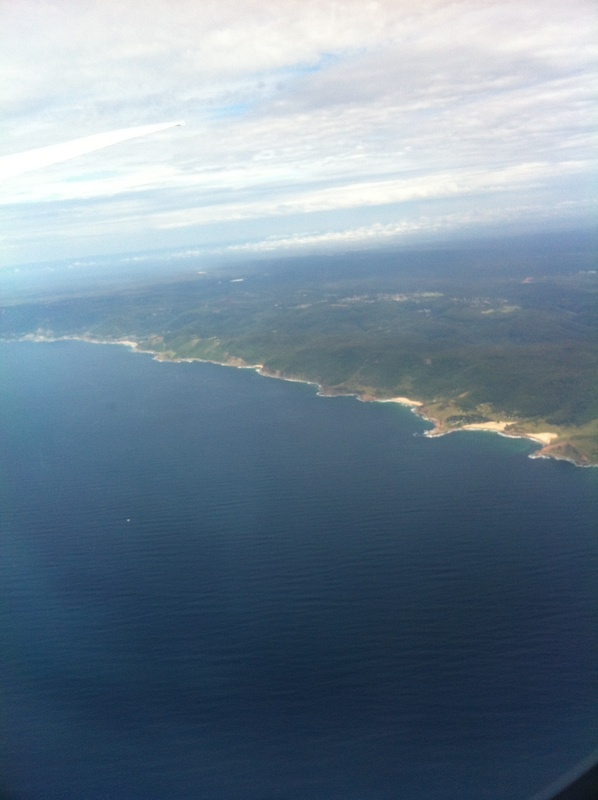 When the plane arrived in Sydney I could already feel the hot sun coming out of the windows. A great view from the plane! My mom and I could not wait to get out and walk in the city; but before we could leave we were informed that our luggage had to be sprayed by a substance, which seemed odd. Anyway, we finally got out, headed to the customs area and took a taxi to our hotel where we took a shower and changed. We were finally ready to go out and go for a walk. Outside, it was very hot and the sun was bright. The city was lovely and filled with beautiful flowers and trees. We were very hungry so we went to a Thai restaurant where the food was very good. After our lunch we returned to the hotel because of the jet lag. We were so tired! We slept until 3 AM and woke up and couldn’t go back to sleep so we started eating, reading, going on the computer, talking to friends and other things. We prepared ourselves and went to a little café to eat breakfast. We returned to the hotel to check out of the room and headed to the Aquarium on foot. We saw beautiful buildings and parks on the way there. The Aquarium was filled with impressive creatures: fish, sharks, platypuses and more! At one moment it even look like we were walking in the sea! It was very fun. After this little visit we went to the Rocks. The Rocks is one of the oldest neighborhoods in the city. The harbour is beautiful and the Opera House too. For lunch we went to the Hyatt and ate a club sandwich and had a beautiful view of the Rocks. We started heading to our hotel but before we tried to have a pedicure. But unluckily there was no place. So we went to the airport and waited for the plane. My mom ate Arabic food and I ate sushi. We got on the plane and after an hour we arrived in Wagga Wagga. Me and my mom at CSU. Lisa and Dan were waiting for us at the airport and drove us home. In the air, we could smell a very good scent (it was the smell of eucalyptus trees); you couldn’t get tired of it. We talked a little with Lisa and Dan and went to bed. Their home is very big and beautiful. 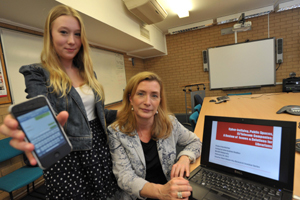 The next morning we woke up, prepared ourselves for the day and went to Charles Sturt University to see my mom’s presentation on cyber-bullying. It was very interesting and my mom and I even got our picture taken for the local newspaper! After we went to Uneke , a restaurant, since we were starving. After we went shopping and I bought two pieces of clothing. I was happy with what I found. Around four o’clock we returned to the University to pick up Dan. We returned home to rest. For dinner we ate pizza and a salad. It was delicious! We talked a little and I went to bed because I was very tired. When we woke up Lisa, my mom and I ate some croissant with jam and some yogurt. We relaxed all morning and after lunch we went shopping. It was very fun and gave us an opportunity to visit the town a little. We picked up Dan at CSU and drove back home to prepare ourselves for dinner. We went to “Thyme out” which was very good. 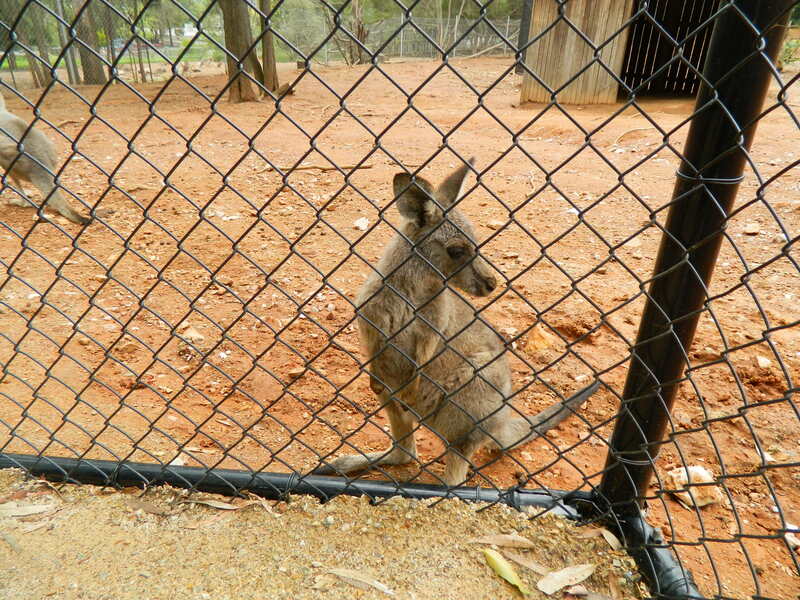 A cute kangaroo who came to see us at the fence at the Wagga Zoo. 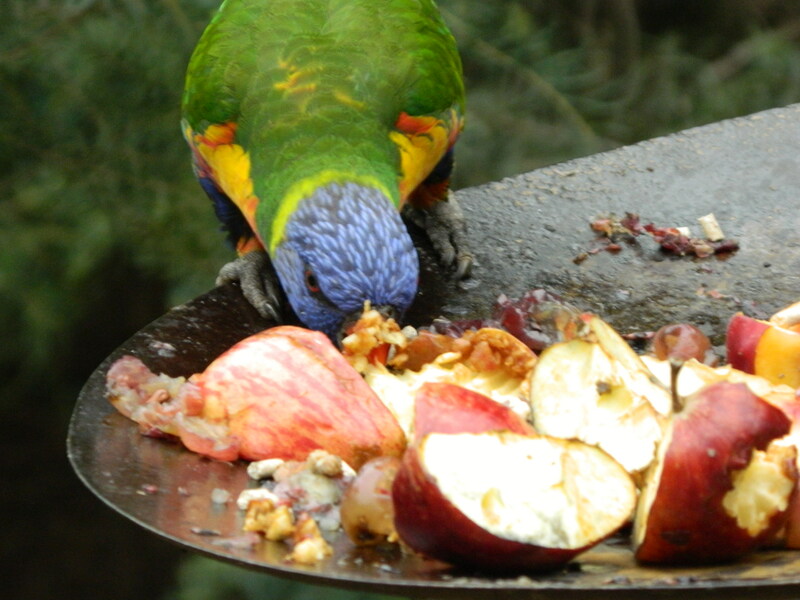 A little lorikeet eating apples. 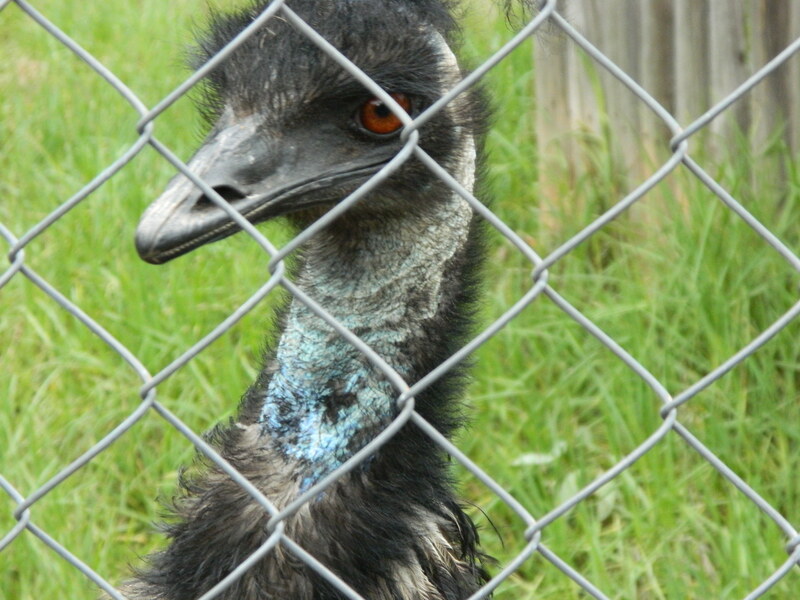 Here's the face of an emu. This entry was posted in Australia, birds, CSU, emu, food, kangaroo, travel, visitors, wagga wagga, weather. Bookmark the permalink.